Last year marked a setback for global investment in renewables and low-carbon technologies. New investment in clean energy worldwide fell to $287.5 billion in 2016, down 18 percent from a record high of $348.5 billion in 2015, according to new research from Bloomberg New Energy Finance (BNEF). But while it’s preferable to see numbers rise, the decline was expected and isn’t all bad, say BNEF experts. The primary cause of the investment drop was a slowdown in China and Japan. In China, clean energy investment totaled $87.8 billion in 2016, down 26 percent from an all-time high of $119.1 billion in 2015. In Japan, clean energy investment totaled $22.6 billion, dropping 43 percent over the previous year. 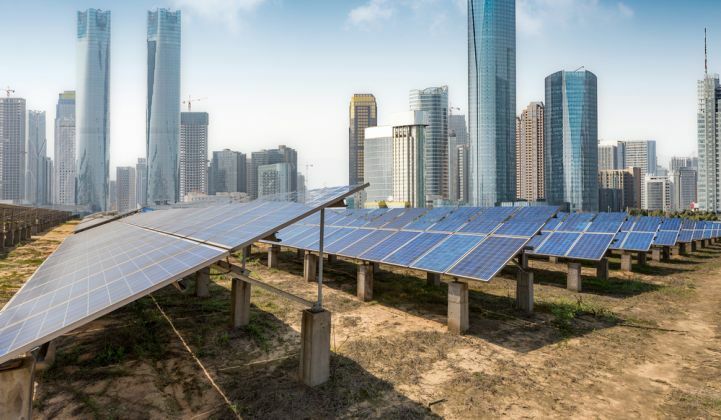 Both countries have seen their renewable energy markets boom in recent years, thanks to some of the world’s most generous feed-in tariff policies, according to Justin Wu, head of Asia research for BNEF. After years of record-breaking investment, China and Japan are now cutting back on large-scale renewable projects and turning their attention to utilizing the capacity they already have. Through the first six months of 2016, 21 percent of wind power in China went to waste and 12.1 percent of solar power in northern China was curtailed, according to the World Resources Institute. In response to the extra capacity, China’s National Energy Administration reduced the country’s five-year wind target by 16 percent to 210 gigawatts by 2020, and cut the country’s solar target by 27 percent to 110 gigawatts by 2020. According to China’s 13th five-year plan, the details of which were reported last week, China plans to invest $360 billion in renewable energy during the 2016-2020 period. That represents a significant investment -- and far more than any other country has pledged -- but it's a lower average annual investment than China has seen in recent years. Because the vast majority of clean energy investment goes into financing assets in the world's most carbon-polluting nation, when China's market dips it moves the needle on global numbers. In nearby Japan, the renewable energy boom started in 2011 in response to the Fukushima nuclear power disaster, which triggered the shutdown of several nuclear reactors. In 2012, electricity suppliers began to fill the gap with clean energy solutions. However, the country is now taking a breather on large-scale renewable energy developments as federal incentives phase out and while fossil fuels remain affordable. “In Japan, future growth will come not from utility-scale projects but from rooftop solar systems installed by consumers attracted by the increasingly favorable economics of self-consumption,” said Wu. 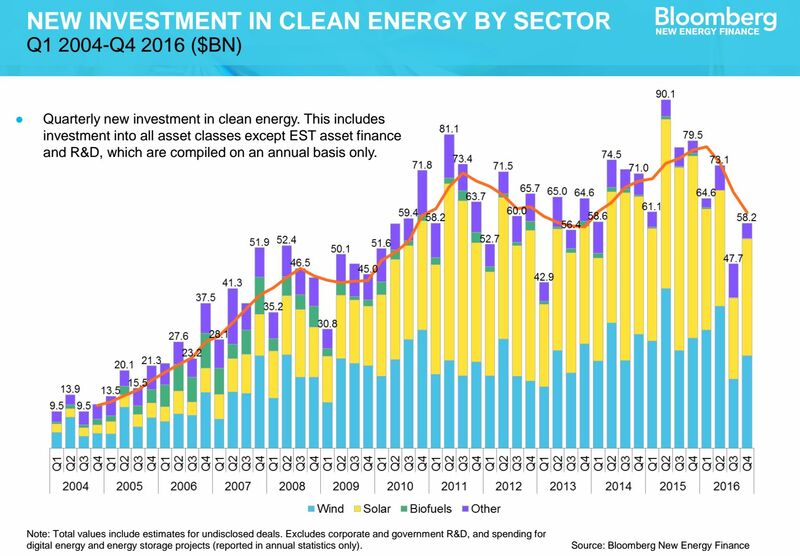 BNEF expects clean energy investment numbers in Japan and China to plateau or slightly decline in 2017. 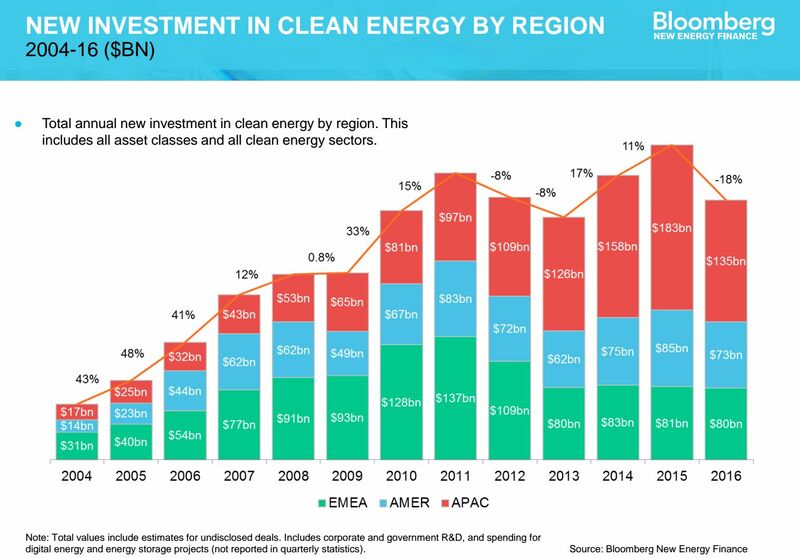 The U.S. also saw clean energy investment slip last year, although not quite as significantly as its top Asian competitors. U.S. investment fell by 7 percent to $58.6 billion last year, primarily because developers slowed progress on wind and solar projects once tax credits were extended by Congress in December 2015. “We were expecting investment to be flat or decline for the U.S. market last year because of that extension; there was just less pressure,” said Amy Grace, head of North American research for BNEF, in an interview. Developers bought up equipment that would be safe-harbored and continue to qualify for the expiring incentive, but those investments didn’t necessarily translate into financing entire projects. In 2017, U.S. wind and solar investment should see a modest rebound, said Grace. Europe was a positive story in 2016, with investment climbing 3 percent last year to $70.9 billion. The U.K. led the European field for the third successive year, with investment up 2 percent to $25.9 billion. Germany ranked second at $15.2 billion, down 16 percent year-over-year, and France ranked third at $3.6 billion, down 5 percent. Clean energy investment in Canada plunged 48 percent last year, largely because the two leading provinces -- Quebec and Ontario -- tapped out their wind markets. The electricity load in other parts of Canada is either too low to warrant new renewable energy projects or is already being served by hydropower. At this point, Alberta remains the one really interesting Canadian province for clean energy investment, said Grace. Further south, investment also slipped as projects failed to secure financing before year's end. In Mexico, clean energy investment fell by 59 percent to $1 billion, in Uruguay it fell by 74 percent to $429 million, and in Chile it toppled by 80 percent to $821 million. On the other side of the globe, investment in South Africa fell 76 percent to $914 million. The BNEF analysis covered wind, solar, biofuels, biomass and other renewables, such as small hydropower and geothermal energy. It also covered low-carbon services and investments in energy smart technologies (EST), such as hydrogen fuel cells, energy efficiency and advanced transportation solutions. While overall global clean energy investment was down last year, it’s important to note that the total capacity installed was not. BNEF found a record 70 gigawatts of solar were added around the world last year, up from 56 gigawatts in 2015. Global wind energy deployments totaled 56.5 gigawatts, according to BNEF, which is down from 63 gigawatts in 2015, but still the second-highest figure ever. Offshore wind in particular saw a banner year in 2016. Capital spending commitments reached $29.9 billion in 2016, up 40 percent over the previous year. The availability of larger turbines and improved economics prompted greater investment from developers in Europe and China. Last year saw the approval of the largest-ever offshore wind project -- Dong Energy’s 1.2-gigawatt Hornsea array off the U.K. coast, with a price tag of $5.7 billion. An additional 14 parks greater than 100 megawatts also received the go-ahead last year, in British, German, Belgian, Danish and Chinese waters. Going forward, new offshore wind markets are set to open in North America and Taiwan. Asset finance of utility-scale solar and wind projects continued to be the biggest category of investment in 2016, although investment fell by 21 percent from the previous year to $187.1 billion. Small-scale projects under 1 megawatt, including rooftop solar PV, saw investment fall by 28 percent, totaling $39.8 billion. Taking all tracked categories of investment into account -- asset finance for large-scale projects, finance for small-scale projects, public markets investments, venture capital and private and research and development -- solar proved to be the leading sector in 2016. Global investment in solar totaled $116 billion, but was down 32 percent on 2015 levels. Wind saw $110.3 billion invested last year, down 11 percent year-over-year. Biomass was more or less level at $6.7 billion. Small hydropower investment was also flat at $3.4 billion. Meanwhile, investment in energy-smart technologies spiked by 29 percent to $41.6 billion and low-carbon services grew 5 percent to 4.3 billion. The investment declines don’t necessarily tell a bad story, said Grace. Lower overall investment costs are due in part to a sharp drop in clean energy equipment prices, and for solar PV in particular, according to BNEF. “Everyone always likes to see increasing investment in clean energy, but the reality is that costs are coming down and reflecting lower costs for more megawatts installed, which is a good sign,” said Grace.